Aluminum Quad Canes: Take A Look At These Features, And You'Ll Understand Why: Aluminum Construction Is Sturdy Yet Lightweight And Comes In Attractive Finishes That Resist Marring And Scratching. 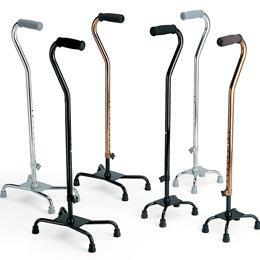 Dual Push-Button Adjustment Mechanism (Height Adjusts From 30" To 39") With Locking Ring Allows For Quick, Secure Fitting And For Quad Cane Bases To Be Ambidextrous. The Non-Skid Rubber Tips With Metal Inserts Ensure A Secure Grip And Long Lasting Performance. Plus, No Assembly Is Required. 250-Lb. Weight Capacity. Limited Lifetime Warranty On Frame And Base. Six Month Warranty On Handles, Tip, Push Buttons, And "Wearable" Parts. Large Offset Handle Quad Canes With 8" X 12" Footprint Chrome.